It’s the kind of story that you don’t exactly see everyday, and it’s an idea that’s probably been tapped already by fans who’ve created their own fan fiction and “What If?” stories where things play out very differently from the actual canon. Yet here we are with an actual alternate reality Spider-Man tale by Marvel that’s sure to intrigue even the most laid back readers out there – because it does not make Peter Parker the hero, but rather one of his primary love interests in Gwen Stacy. Yes, the same girl who was played by Emma Stone and featured prominently in Marc Webb’s two Amazing Spider-Man movies has hit the jackpot, as writer Jason Latour and artist Robbi Rodriguez introduce a version of the character who was bitten by a radioactive spider instead of Mr. Parker, turning her into that reality’s web-slinging heroine – The Amazing Spider-Woman. Her tale is just part of a bigger thread being weaved together however, as this month all the way to the end of October serves as the build up to the biggest and most ambitious Spider-Man crossover event ever coming this November… And it’s called Spider-Verse – where “EVERY SPIDER-MAN EVER” from all realities have to join forces in order to combat a common threat that’s out for their lives. Edge of Spider-Verse #2 is just the second issue in a self-contained subseries that introduces a Spider-Character who will play a role in that comic book event. 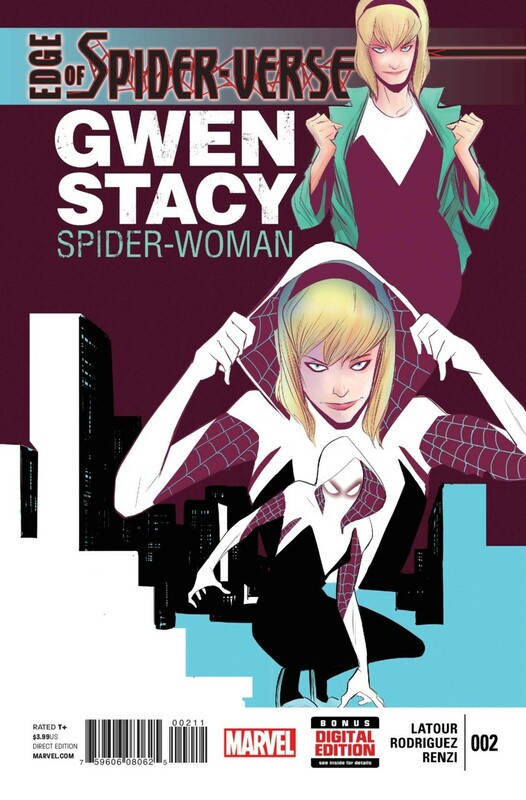 It also shows us what kind of Gwen Stacy we’re dealing with, focusing on a very streamlined tale that sums up her origin in the first few panels and literally dives down to the present day where she’s an established vigilante that fights crime and is wanted by the police at the same time. It’s these characteristics that separate and make her unique from our friendly neighborhood Spider-Man, and it’s the kind of book that will draw people just out of curiosity to give this one a spin. Now here’s the review for those looking for a reason to pick up the book, and be warned the article will contain MILD SPOILERS, so be sure to read at your own risk… Or do so to know whether you’re walking into a tangled web or something you’ll really want to consider getting for the sake of curiosity and collecting. In many ways, Edge of Spider-Verse #2 can be considered a one-shot issue. You don’t necessarily have to collect the entire Spider-Verse storyline if all you want is “Spider Gwen“, so this is her debut issue right here and it does a fine job of introducing your new “friendly neighborhood female webslinger”. However, it goes without saying that you have to be a passionate Spider-Man fan to understand the nooks and crannies of how things have changed, with emphasis on “the road not taken” suddenly becoming the norm and everything we knew that was established as Earth-616/ Regular Marvel Universe canon is non-existent. This is Gwen Stacy’s story as a “Rebel without a Cause“, and living the life of a superhero trying to balance power and responsibility together. Peter Parker still factors into the tale, but the role reversal between him and Gwen has made his part an unfortunate tragedy that I can’t really say anything about unless I go into spoiler details. Let’s just say his participation is what drives Spider-Gwen’s guilt and determination to serve her fellowman, and that’s where things get a little complicated for our brand new webhead wonder woman. 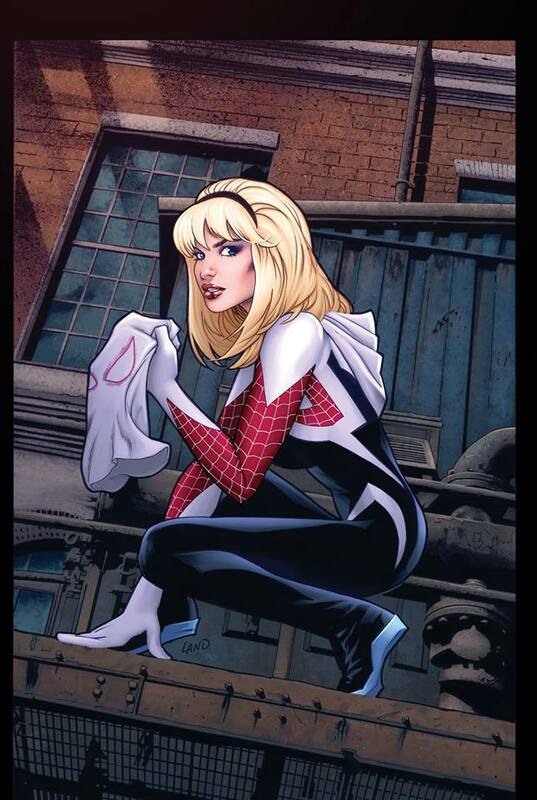 Much like how Andrew Garfield personified a Peter Parker who’s somewhat emotional and introverted in the Amazing Spider-Man films, Gwen Stacy is a mirror image of that characterization in her Spider-Gwen persona. Latour gives a nice spin to this version of Peter’s first true love by making her someone that most teenage girls can relate to. She’s a musician who’s part of a band called the “Mary Janes“, and she has a loving father who also happens to be the Captain of the New York Police Department. However the sense of irony is not lost there, as Gwen’s dad also happens to oppose Spider-Woman’s methods, and will do everything in his power to put her behind bars. Public perception isn’t helped either by the constant banter and criticism of J. Jonah Jameson, and other familiar faces who you’d think were allies suddenly become the villains of the story. Everything’s upside down in Gwen Stacy’s world if she were the one to put on the spandex, but she’s got the same kind of wit and cocky attitude as Peter Parker’s Spider-Man, and she handles it with finesse, grace, and beauty that you can’t help but LOVE THIS CHARACTER. Oh, and in case it wasn’t already obvious, the costume is just BEAUTIFUL. 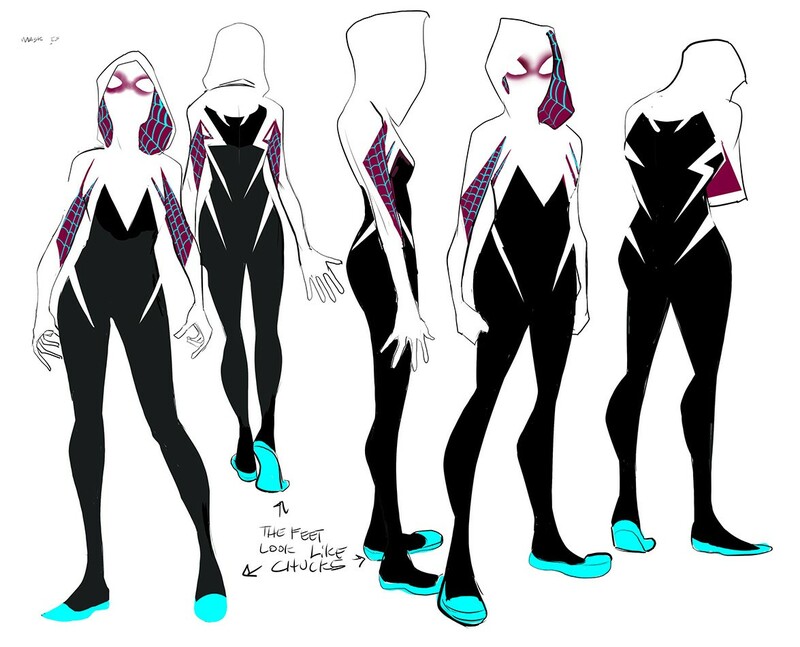 Robbi Rodirguez is just the perfect penciller to bring Spider-Gwen to life, and that design of a white/ black/ purple Spider-suit with a hoodie is just screaming Cosplay waiting to happen. Overall, getting this issue was really all about seeing how the concept of Gwen being Spider-Woman was going to work differently, and the payoff was absolutely worth the wait. If you’d like to see more of Spider-Gwen’s adventures, you’ll have to follow the rest of Spider-Verse as it plays out, with the main event itself happening this November. How she factors in and whether she becomes a key player in the fallout of the inevitable battle to come still remains a mystery. All I can say is that this was a great introductory issue to a superb new concept of a beloved Spider-Man character, and I’m all for seeing more soon.